Steven Soderbergh’s movies I find either rather uninteresting (the Ocean’s franchise) or quite interesting (most of the smaller, low-budget efforts). I think I was never enthusiastic about one of his films, even though I recently liked Contagion and The Girlfriend Experience quite a bit with their respectively cool approach to their subject matter. It seems Soderbergh never really left film school, plays around with new formats, and takes an intellectual approach to finding out how to use them. Fine with me, but leaves me at a distance. In Haywire, he does this with Bourne and Bond movies, injects a female lead, sprinkles A-list actors aplenty over it and tries out some very physical approach to action set pieces: people beating each other up, strangling each other, trying to break bones. That is something I can appreciate, but do not really love when it is used excessively. He clearly wanted to make a film with Gina Carano, and that’s what she does, so here we go. She is actually an attractive lead, not even for her physical prowess, but for her attractive looks and unpretentious acting. 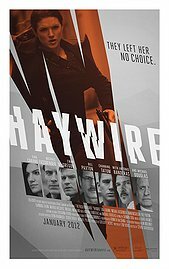 As a story of the super agent being crossed and double-crossed, Haywire does not have too much going, but style, action and Michael Fassbender make it an entertaining and interesting movie nonetheless.